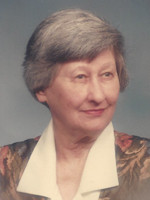 Grace Forrest Kruszewski, 92, passed peacefully on Wednesday, April 3, 2019, with her two sons by her side. She was a native of Poquoson and had been a longtime resident of Newport News. Grace assumed many roles throughout her life. She was a devoted wife, mother, and grandmother. Her interests and passions could not rival her love for family or her childhood home of Poquoson. Affectionately known as “Granny” she took great pleasure, pride and joy in her grandchildren. The moments we shared with you in this life will be treasured and forever in our hearts. Grace was preceded in death by her loving husband, Dr. Edwin Kruszewski; parents, Reginald and Grace C. Forrest; and grandchildren, Lane and Ryan Kruszewski. She is survived by her sons, Reggie and wife, Suzanne, and Michael and wife, Diane; her grandchildren, Leah, Jackie, Jonathan and Michael, Jr. The family will receive friends from 10:00 – 10:45 am on Monday, April 8, 2019 at Weymouth Funeral Home, immediately followed by a graveside service at 11:00 am at Peninsula Memorial Park. Arrangements by Weymouth Funeral Home.